I'm new to the forums and a bit noob when it comes to MTBing. I've been into MTB for quite some time long time ago, but about 8 years ago I had to stop. Since then I only done commuting on my MTB for about a year (winter included). That was 3 years ago. For the past 3 years my bike was unused, but I decided enough is enough. Done a full service to it and started off-road cycling again. Anyway, the reason I've created this thread is to ask for some advice. My bike which I had 8+ years ago was a custom built Scott with aluminum frame, Magura hydraulic brakes (very expensive at the time) and Shimano SLX groupset. At the time it was a crazy expensive bike (even the frame was custom made in a brushed aluminum colour with no paint whatsoever). That bike is gone however and the one I have now is not a state of the art bike. 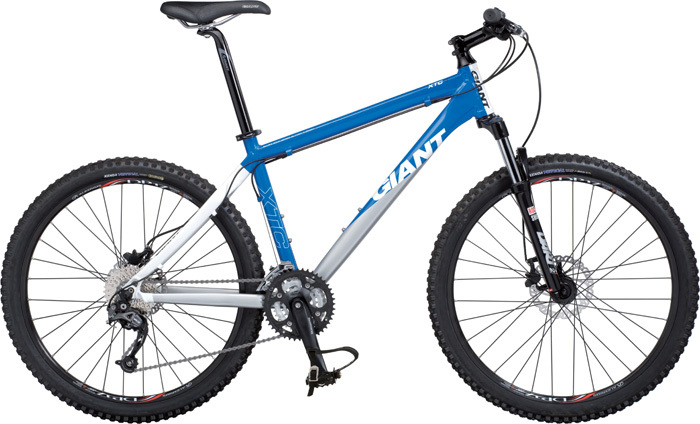 It's the 2009 Giant XTC4 bike, at the time it was £600 bike, so low to mid range price bracket. I understand that this is one of the mass produced bikes, but it has been a long time since I was into MTBing and I don't know much about it anymore. So as in title, if you were the owner of this bike, would you build around it (upgrade wheels, gears, brakes, etc) or would you sell it and start from scratch elsewhere? The question is a bit theoretical for now, because I firstly need to see that I am committed enough to justify spending £xxxx again. What he^^^ said, if you're comfortable with the bike then ride it as it is, my MTB is 9 years old this year and I still love it! Thanks guys, as I said it is still just a theoretical question. Most likely I will do all my cycling on this bike this season, but I already think about future (don't we all). For example, the wheels in this bike are a bit rubbish (at least I think so). So I thought about maybe upgrading the wheels this season. But there is no point investing in this bike if it is not good enough platform for a future better build. Hence my question. Nice bike... You've got a good frame with some budget-end components on it to keep the price down when new, so a good base to work with... in time... The XTC1 was a XTR laden cross country whippet with the same frame as you have there I think. Why replace bits now that don't need replacing? Riding slowly to make you all look faster. Good point. There is nothing major that needs replacing at the moment. However many parts now squeak and click. My rear disc is slightly touching my pads slowing my back wheel and making a audible squeeks. The bike is just after a service and the guy said that he had a bit of a nightmare trying to set up this break. One of the pedals is clicking. My seat is making some strange noises too. Sometimes when I change my front gear from 3 down to 2, the chain gets stuck for a second causing a complete stop to the whole mechanism which sometimes causes my feet to slide off the pedals, because it is very sudden. Nothing major but still makes me think how long will I get from this bike. I do like that frame, it is exactly my size and a bit longer than in my previous bike, which is a good thing. THe downside is that it will not fit a rear suspension. Get back on your bike no matter how hard your mates are laughing at you remember the next off could be them, revenge is sooo sweet !!! IIRC the rule of thumb is that I should replace my 100mm Dart 2 fork only with another 100mm fork, otherwise I will be causing additional stresses and stress points on my frame on a rough terrain. And if I'm not mistaken the biggest overall improvement I can make to this bike is by changing the wheels. No other upgrade will improve the bike as much as the wheels. STEM	Giant A5 aluminium O.S. Do you think Mavic Crossride is a good choice? I must admit that I look quite a bit on full susp bikes lately, but I think I'll work a little bit on this one first and see where it gets me. I've ordered new flat pedals yesterday and now thinking about the wheels. Just not sure are the Mavic Crossride a good choice and which ones to go for, hence my question above.